In Pennsylvania, text messaging is banned for all drivers. There's an increased penalty for drivers with a BAC of 0.16 or above. 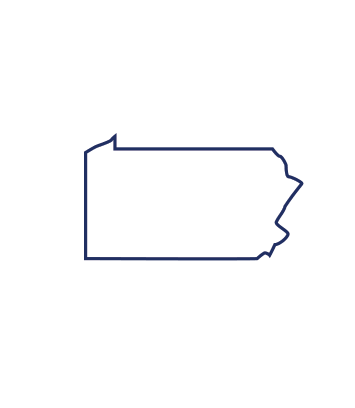 Administrative license suspension on the 1st offense: In Pennsylvania, law enforcers can confiscate a first-time offender's driver's license for 6 months if he or she exceeds the legal limit. Limited driving privileges, such as to and from work, are permitted with an Occupational Limited License (OLL). These are devices installed in the cars of convicted drunk drivers, which analyze the breath or the driver before starting the vehicle and disable the ignition if alcohol is detected. Pennsylvania made the installation of ignition interlocks mandatory for repeat offenders. No driver or passenger can have any receptacle that contains any amount of alcohol that is open or unsealed in his or her possession or in any area of the vehicle where it would be easily accessible by the driver or passengers. (Supervised driving, to be completed with a driving test): At 16 years of age, individuals can begin driving with supervision for a period lasting a minimum of six months. In this stage, the new drivers are required to get 65 hours of supervised driving, 10 of which need to be at night and five need to be in inclement weather. (Some limits are applied to unsupervised drivers in high-risk situations): Drivers who passed the driver's test at 16 and six months are now unsupervised drivers in the intermediate stage. These drivers are not allowed to drive between the hours of 11pm and 5am and cannot drive with more than one passenger under 18. (Full driver's license): At the age of 17, Pennsylvania drivers who took driver's education and have twelve months free of crash or conviction can now get a standard driver's license without any restrictions. Drivers who didn't take driver's education must wait until they turn 18 for a full driver's license. Monday through Friday (except holidays), from 8 a.m. until 5 p.m. ET.